Basseterre, St. Kitts-The people of St. Kitts & Nevis may soon have another reason to pay close attention to next year’s Olympic Games in London, because their National Under 23 Football Team stands a very good chance to qualify, for the first time, for that major sporting event, to be held in the summer of 2012. The journey to the Olympics will however continue from this Thursday 24th November, when St. Kitts & Nevis meets three other top Caribbean teams, in the CFU Finals of the qualifiers. The local team is still riding high on its recent victories in the first round of the qualifiers when they defeated the likes of Haiti, St. Lucia and Antigua & Barbuda. An official of the St. Kitts and Nevis Football Association, SKNFA, has indicated that the weekend matches will be played on Thursday 24th, Saturday 26th and Monday 28th November and he said every day will be a big day with two big matches because of the high caliber of teams and nations involved in this CFU Finals. When the whistle is blown for the opening day on Thursday, Trinidad and Tobago will meet Cuba at 6:00pm, while St. Kitts & Nevis battles against Suriname at 8:00pm. On Saturday, Cuba will come up against Suriname at 6:00pm followed by the encounter between St. Kitts & Nevis and Trinidad and Tobago; then on Monday 28th it will be the big showdown between Cuba and St. Kitts and in the second game at 8:00pm but this will be preceded by the earlier match with Trinidad and Tobago and Suriname at 6:00pm. Cuba has already arrived in St. Kitts ahead of the tournament but Suriname and Trinidad & Tobago are due to arrive in the island on Tuesday. The Cubans arrived in St. Kitts on Monday morning. 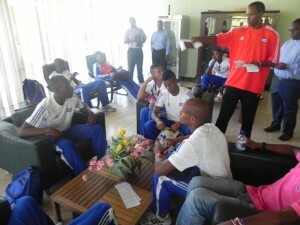 Speaking at a brief ceremony, in the VIP Lounge of the RLB International Airport, President of the St Kitts and Nevis Football Association, Mr. Anthony Johnson, welcomed the Cuban delegation, wishing them the very best in the tournament but of course indicating that the local team has every intention of excelling against all opponents. Mr. Johnson also said that the SKNFA will do all in its power to ensure that they have a comfortable stay and added that the tournament will be very competitive and he hopes that it will be played in the spirit of fair play. Also making brief remarks was Mr. Jorge D. Payret Zubiaur Resident Cuban Ambassador, who stated that he would like to see a result in the game between Cuba and St. Kitts & Nevis, unlike the nil-nil drawn match when the senior St. Kitts and Nevis team played Canada. Head of the Cuban team, Luis Hernandez Valdivia thanked the SKNFA for the warm welcome and for its hospitality and added that his players are determined to do well in the competition. The SKNFA has confirmed that tickets for the matches are being sold at EC$20 for the Grounds and EC$30 for the seated stands and are available at the Football House at Lozack Road.